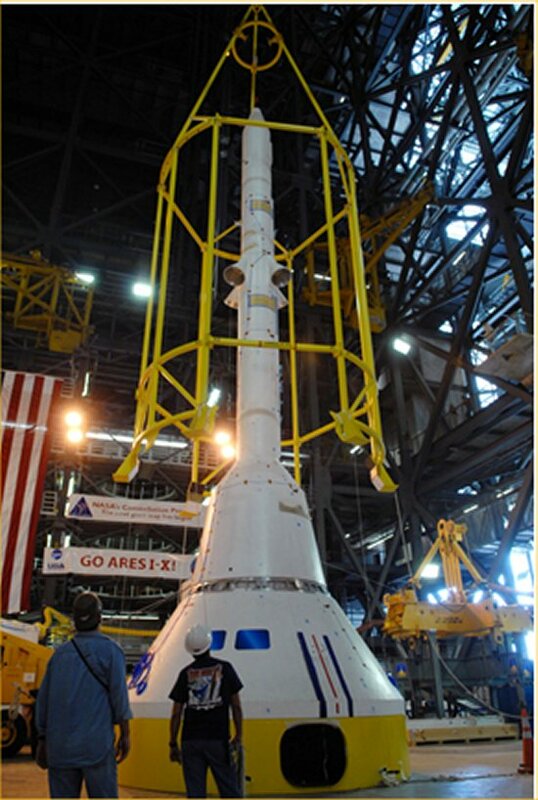 Earlier this month the Ares I-X team conducted a successful frustum separation test. The success of the test showed that the separation charge is fully capable of splitting the joint of the frustum’s aft ring — an important hurdle to clear. The test simulated the first separation event that will happen about 2 minutes after launch when the propellant in the first stage booster is used up. 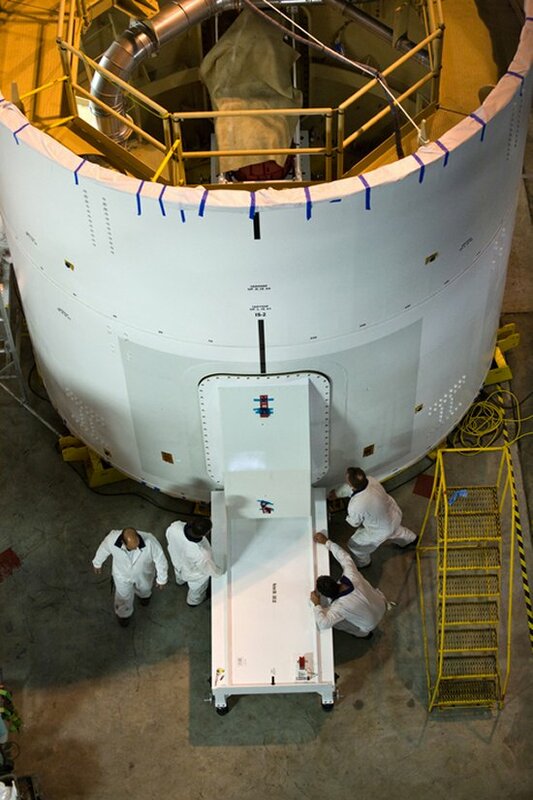 After the booster burns through all the propellant, the first stage (bottom half of the rocket) splits from the upper stage simulator and crew module/launch abort system simulator (upper part of the rocket). This split happens at a piece of the rocket called the frustum. The frustum is an upside-down cone-shaped piece that connects the skinnier first stage to the thicker upper stage. The large forward (top) section of the frustum, which connects with the upper stage, is eighteen feet in diameter while the aft (bottom) end is twelve feet in diameter to attach to the booster. During separation, linear shaped charges detonate at the frustum’s aft ring, allowing the first stage to return to Earth where it will be retrieved and refurbished for other Ares missions. The shock created by the charge was measured by accelerometers and acoustic pressure sensors. Measuring the shock is an important part of the test because if the bang is “too big for the buck,” it could damage some of the avionics or other pieces of hardware. It’s a balancing act between having a bang that is strong enough to separate the metal but not so strong as to damage the working parts of the rocket. 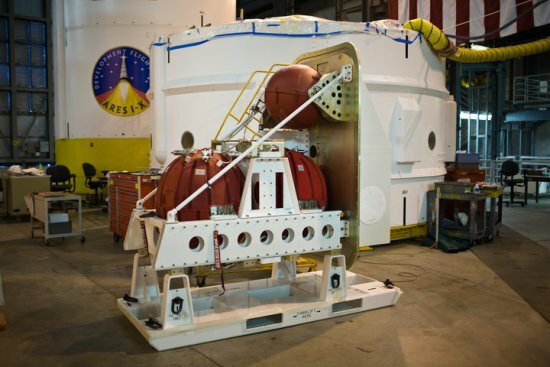 The test took place at ATK’s Promontory facility in Utah. 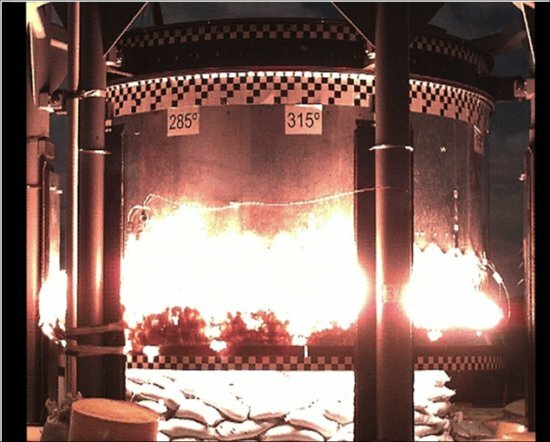 The data from the test will be used to prepare for the Ares I-X flight and will help Ares I engineers make sure the calculations they are currently using are correct. The launch of STS-125 was absolutely beautiful! That’s one of the best things about working in the space business — getting to watch the shuttle launch. 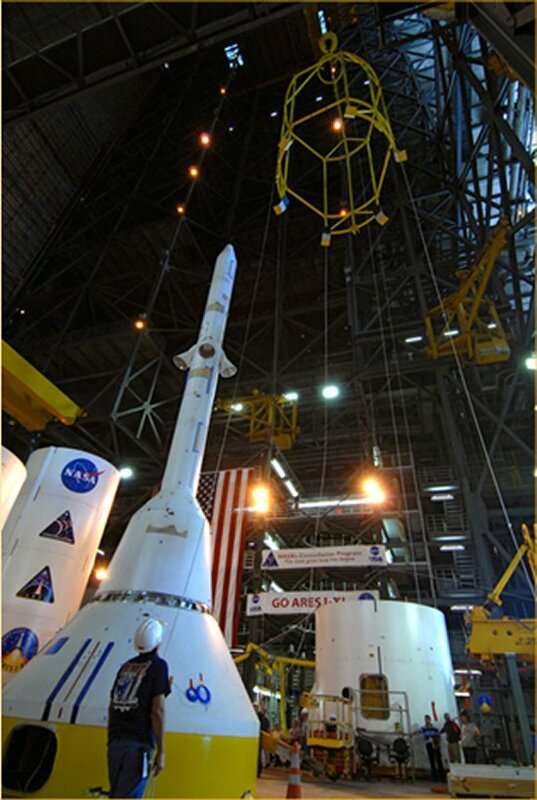 If you haven’t ever had the chance to see a shuttle launch in person you might be interested to know that there is a whole lot going on at KSC leading up to the launch. For the few days before launch all of KSC is bustling with people from all over the world who have come to see or help out with the launch. 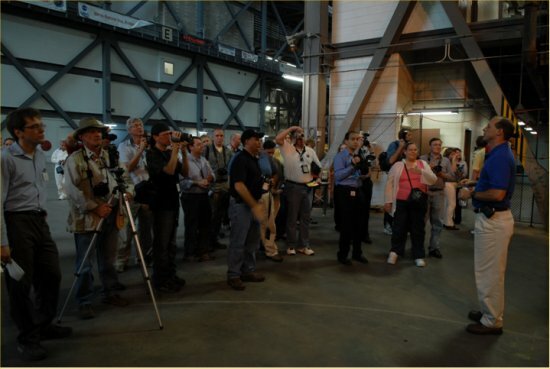 This time, two days before launch, the Ares I-X team took an overflowing busload of media to the Vehicle Assembly Building for an Ares I-X media opportunity. 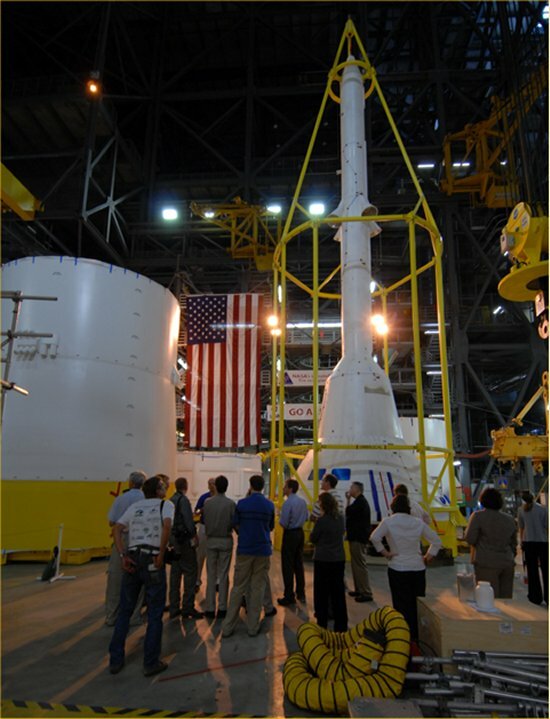 As we walked into the building, the media were in awe at how big the rocket is going to be. Until you see it in person, it is hard to get a reference for how big 327 feet can be. We proceeded down to High Bay 4 to meet up with Bob Ess, mission manager, and Steve Davis, his deputy. We split up into groups and toured the bay from the floor as well as from the fifth level. 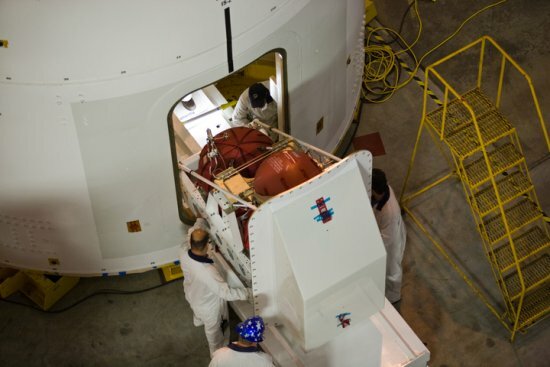 The media had many questions and were excited to see how much progress we have made in processing the upper stage. Videos, pictures and pens were going a mile a minute trying to capture every little detail. It was hard to get the media to leave the VAB and get back on the bus! If we let them, they would have stayed all day. Not to worry, we’ll be back in a month or less. 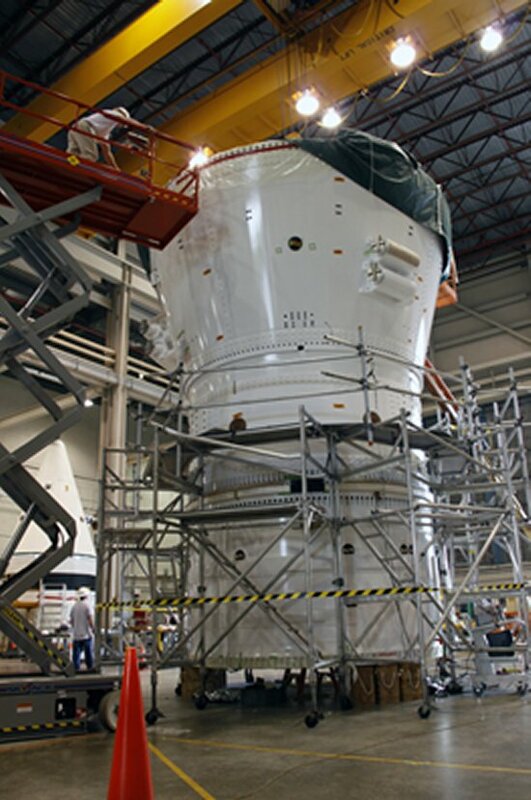 The second of the two roll control system modules for Ares I-X was installed into the rocket’s interstage this week in the Vehicle Assembly Building at Kennedy Space Center. These photos were taken in the Vehicle Assembly Building from the fifth floor crossover looking down into the bay. 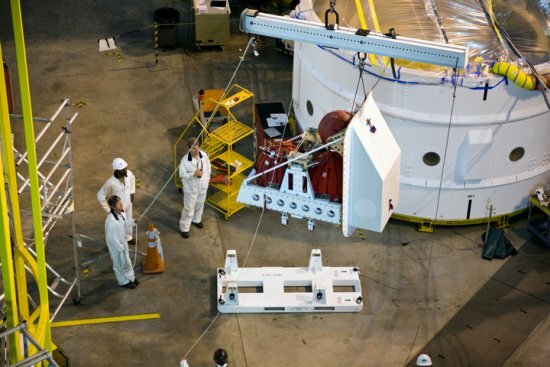 The roll control system modules were loaded with their propellants at the Hypergol Maintenance Facility before being moved over to the Vehicle Assembly Building. The propellants (nitrogen tetroxide and mono¬methyl hydrazine) are hypergolic chemicals, which means they spontaneously ignite when they come into contact with one another. 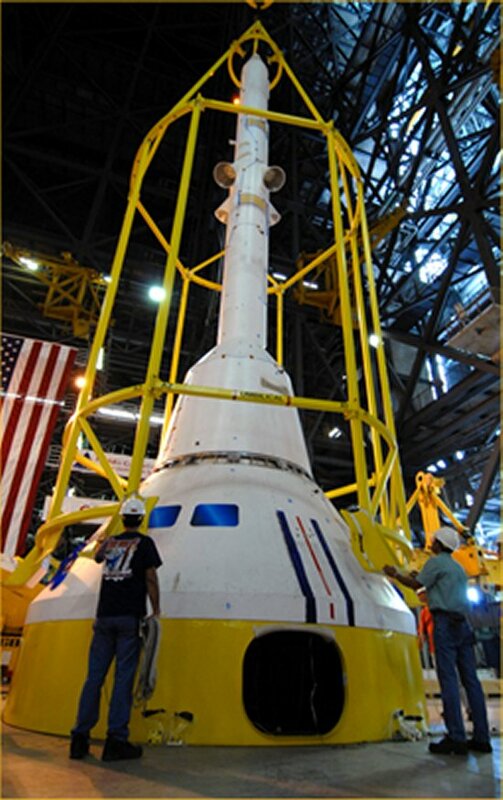 The roll control system is designed to perform a 90-degree roll after the rocket clears the launch tower. It will also prevent the rocket from spiraling like a football during flight and maintaining the orientation of the rocket until separation of the upper and first stages.